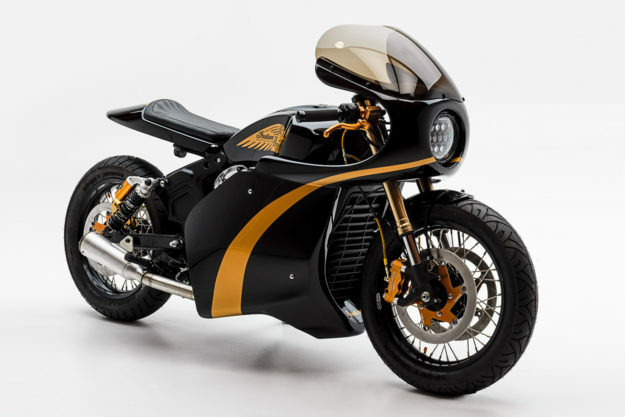 A heavily modified 1970 Ducati Scrambler, a barnstorming Indian Scout cafe racer, a super-rare Norton racer, and a Honda-powered Redline BMX bike. It’s a mad, mad, mad, mad world. Indian Scout Bobber by PJ Grakauskas It’s hard to believe it’s over a year since Indian pulled the wraps off the Scout Bobber. In that time, we’ve been treated to a handful of custom interpretations—but this fully-faired cafe from PJ Grakauskas clearly takes the cake. PJ was one of three ‘backyard builders’ picked by Indian to tackle their own build. 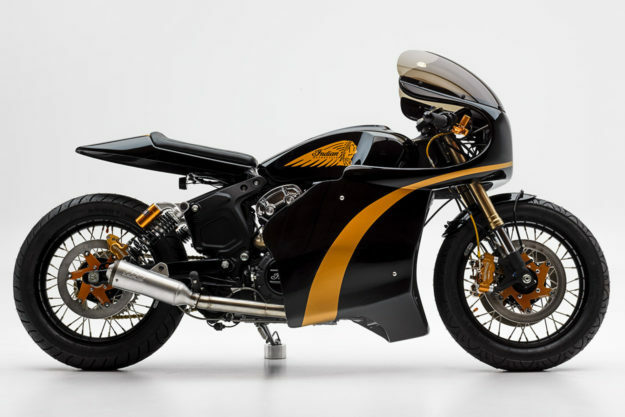 A design had to be submitted before the keys to a new Scout were tossed over, and the Ohio-based safety inspector found himself racing towards a Sturgis deadline—in competition with a mechanical engineer and a NASA engineer. On top of the shiny new Indian Scout, PJ had $10,000 at his disposal for parts and fabrication, but only 12 weeks to complete his design. The largest transformation obviously comes courtesy of the new bodywork, which PJ designed before commissioning Krossover Customs to mold. 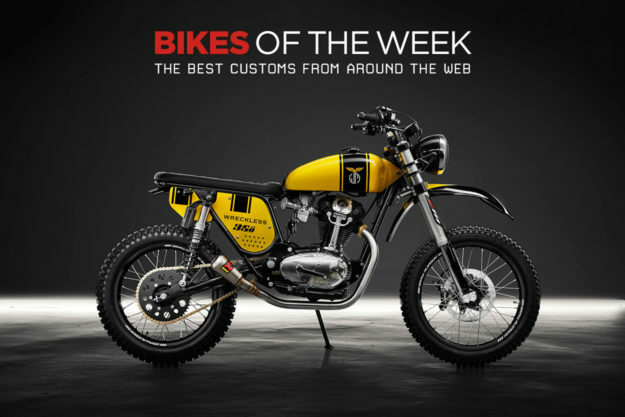 Ducati 350 Scrambler by Wreckless Wreckless is an English custom shop with a special interest in Ducatis from the 60s and 70s—and stellar skills in restomod work. 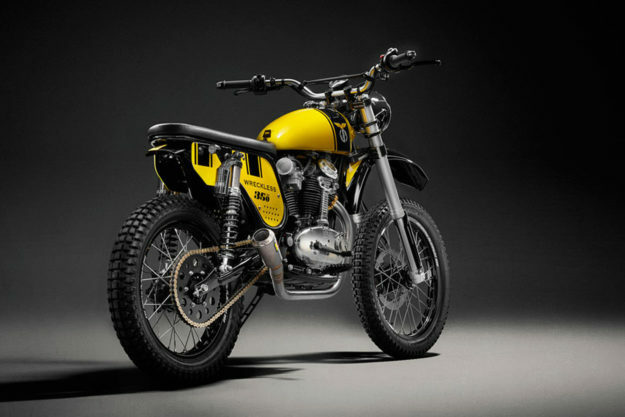 This latest creation designed to fill the Northamptonshire forests with noise is a 1970 Ducati 350 Scrambler, and it’s as pretty as they come. 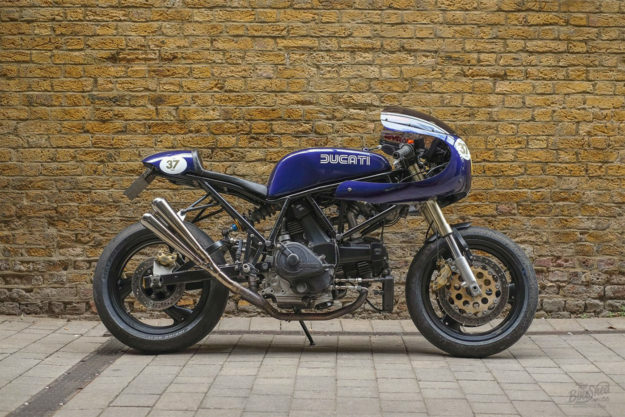 Richard Gaell and his crew weren’t concerned about a factory correct job, so the Ducati has been tweaked in favor of performance and style. The frame has been shortened, the subframe has been flattened, and the wheelbase extended 40mm overall. 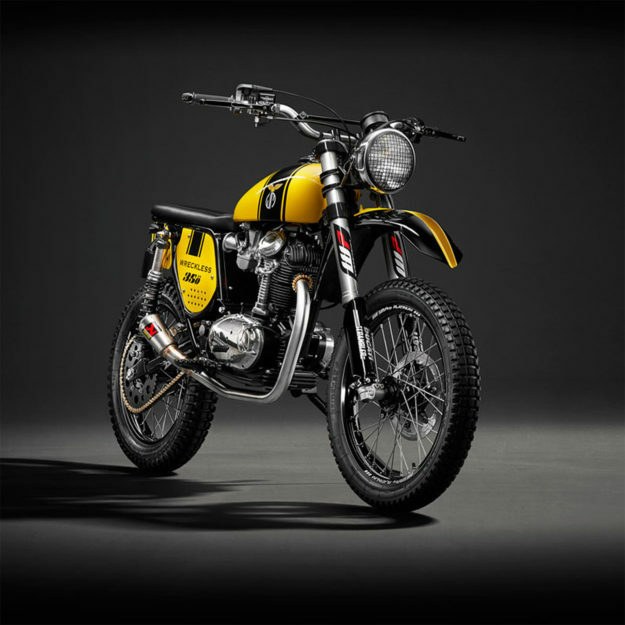 The Scrambler now rides on a set of SM Pro rims and has a new set of WP forks up front—and a pair of Öhlins piggyback units in the back that offer over 13 inches of travel. Control is delivered via a set of bars from Renthal and the brakes have been upgraded with single unit up front from Beringer. 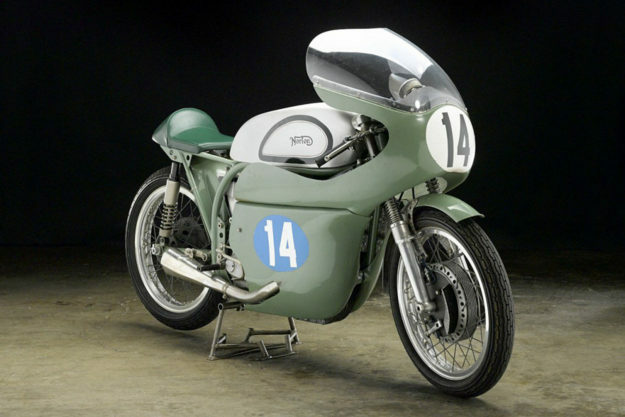 1961 Beart-Norton 350 Manx Racer If Manx Nortons are your jam, then the name Francis Beart is undoubtedly familiar. His Ludlow Green machines notched 11 Manx wins, along with a baker’s dozen of other podium finishes. This stunning example of Beart engineering is named ‘Sabrina’: more formally, it’s a 1961 Beart-Norton 350 Manx Racer, and is the last Beart racer ever built. It’s hitting the auction blocks of Bonhams at the end of September, and we had to share it. As the story goes, a magnificently monikered ‘Mr. 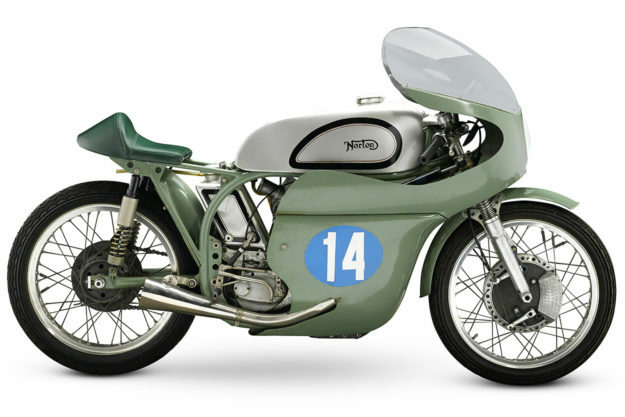 Craze’ sold this particular Norton to Beart in 1962. Beart plied his magic to prep it for the Junior Manx GP in 1963: steel was replaced with aluminum, bolts were hollowed, and the rims were swapped for the narrowest set he could find—to reduce weight. A two-piece Jakeman fairing was fitted up and a custom fuel cell was fabricated to incorporate a small chin recess, to aid the aerodynamics. Rob Jarvis’ Ducati 750SS racer A few weeks back, Dutch and the lads from The Bike Shed held their first ever Cafe Racer Cup at Lydden Hill, just outside of Kent. The event was open to riders of café-styled customs, both old and new. 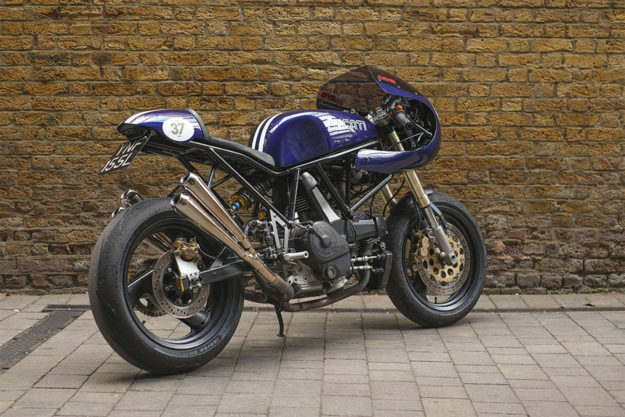 BSMC regular Rob Jarvis showed up on this race prepped Ducati 750SS. The bike came to Rob, essentially ready to race, via eBay. It had been worked on by Bangs Racing, and Rob figured it was the perfect fit for the Cup. The bike had already received the requisite humped rear, had its suspenders upgraded and a front fairing fitted. Clip-ons and rearsets were also part of the deal, so really Rob just had to get the bike to the starting line. Except he almost didn’t. An impromptu ‘getting to know you’ ride ended in disaster when Rob had to lay it down five minutes into his journey. With only a week until the flag was set to drop, Rob had the Duc sent to Ray Petty to get it back up to snuff. While Rob began the healing process of his busted wrist, Ray fixed the cosmetic damages and replaced broken and aged hard parts. New rearsets were mounted up, the clip-ons were replaced, new discs were attached up front and both front and rear sprockets were swapped. 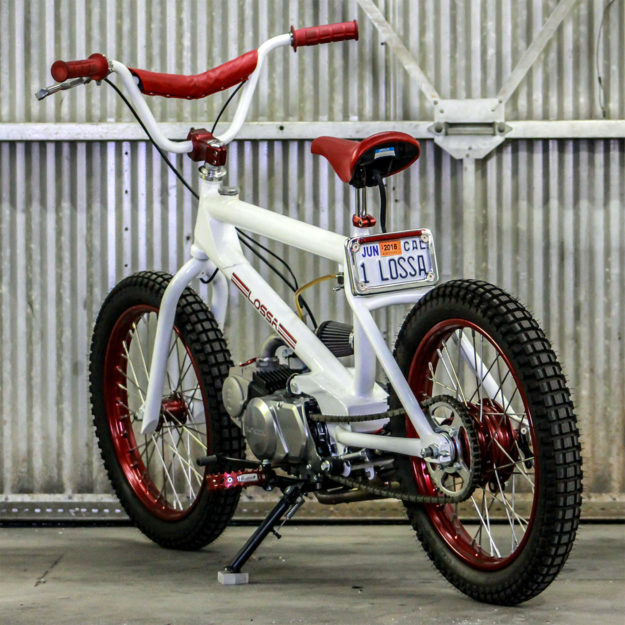 Honda-powered Redline BMX When I was a kid, there were scant moments in the day when I wasn’t out on my BMX bike. I ate, slept and breathed the sport—and can still recall most of the dialogue from that mid-eighties classic, Rad. So it’s no surprise that I’m utterly in love with this creation from Lossa Engineering, a Honda-powered Redline. Apparently Jay LaRossa has an affinity for Redline bicycles (I was more of a GT man, myself). 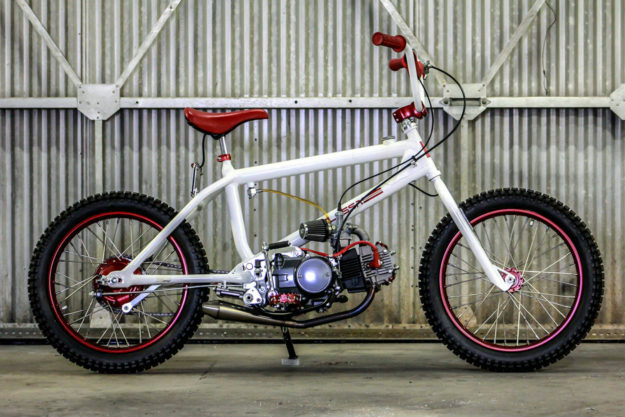 With a Honda CT90 sitting in his shop with no fixed plans, he went to work creating a 50 mph tribute to the 80s. Today, all that remains from the old step-through are its motor mounts and hoops. 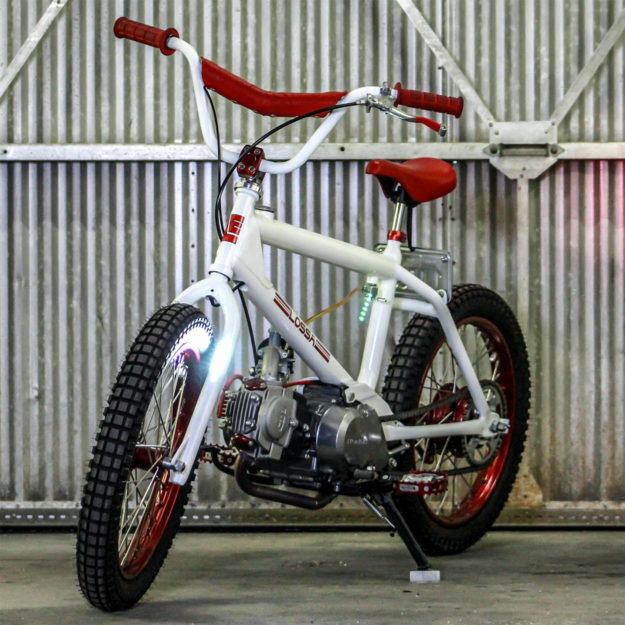 Jay fabricated the BMX-style frame from scratch, integrating the fuel cell into that fat top tube. A set of Redline Pro-Flite V-bars are clamped by a Redline stem and mate to an old pair of BMX forks Jay had laying around. A pair of shin-gnashing beartrap pedals have been fitted up as pegs.